In an effort to broaden Metro’s outreach efforts, members of the nonprofit group Chrysalis — adorned in purple Metro polos, black Metro hats, and yellow safety vests — walked selected streets of Los Angeles’ Fairfax neighborhood to deliver the latest info about construction on the Wilshire/Fairfax station, as well as news on the Purple Line Extension. In partnering with Chrysalis, Metro is supporting a Los Angeles nonprofit committed to changing the lives of low-income and homeless Angelenos through job placement — among those jobs is distributing information on the upcoming Wilshire/Fairfax construction, which will begin in February. To help its clients prosper, Chrysalis leverages community partnerships and local hires. 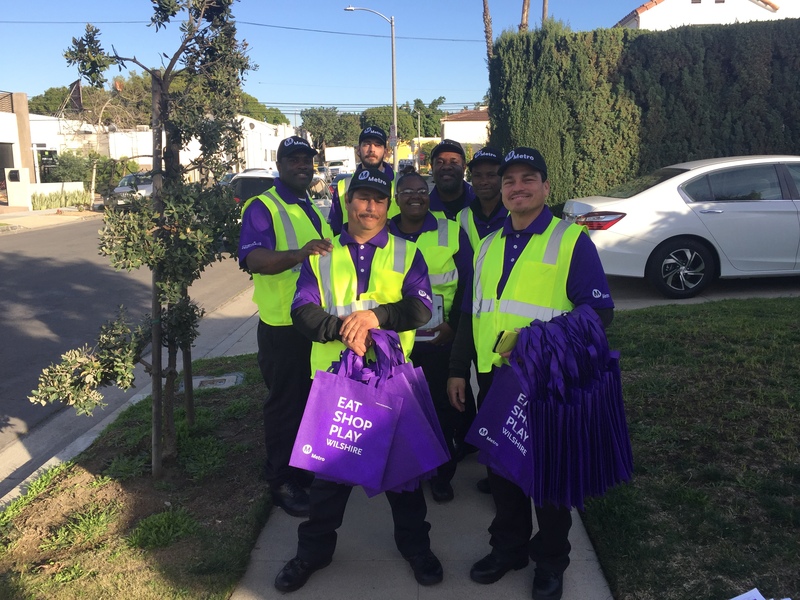 Chrysalis was successful in executing grassroots community outreach during La Brea Station Decking and is now conducting a second round of outreach to more than 1,100 residents in the Fairfax neighborhood. “The crew is really enjoying the work. They feel like celebrities, the community is really welcoming and excited about the PLE,” said Adam Hirsch, Business Development Manager for Chrysalis. Decking the Wilshire/Fairfax Station — the second of three stations for the first section of the Purple Line Extension — will require closures and detours over the course of 18 weekends. More about that as we get closer to construction. I assume you meant “latest” instead of “least” info in the first sentence?